At Genecov Plastic Surgery Group, we accept a variety of payment options to help you achieve your cosmetic enhancements goals. Payment can be made in the form of cash, check or credit card, as well as financing through the companies listed below. We are pleased to offer cosmetic surgery financing through one of the nation’s leading cosmetic surgery payment programs. Use CareCredit® to make it easy to afford any cosmetic surgery procedure you desire! 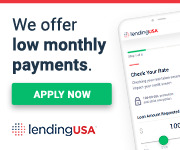 LendingUSA is a fast and affordable option for you to get the look you have always wanted to finance your cosmetic surgery procedures. Apply in our office upon your visit!